Do you love to travel or go on an adventure? Do you enjoy beautiful scenery or just going out for a walk or drive? Then this "Always take the scenic route" graphic t shirt featuring an island with palm trees, umbrella, and birds is just for you! This shirt makes the perfect gift for family and friends who love to sight see, travel, lounge, and take in the fresh air. Perfect for birthdays, anniversaries, summer time, and holidays! Do you love to travel or go on an adventure? Do you enjoy beautiful scenery or just going out for a walk or drive? 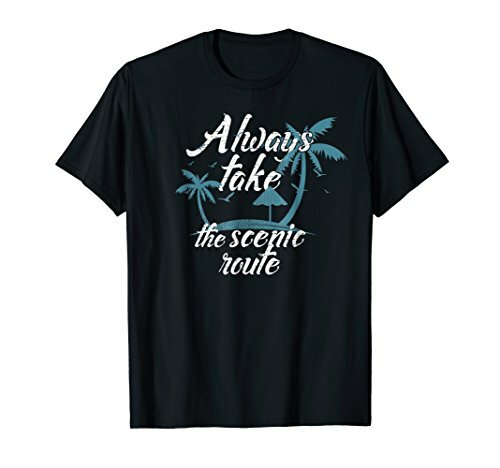 Then this "Always take the scenic route" graphic t shirt featuring an island with palm trees, umbrella, and birds is just for you! This shirt makes the perfect gift for family and friends who love to sight see, travel, lounge at the beach, and take in the fresh air. Perfect for birthdays, anniversaries, summer time, and holidays! If you have any questions about this product by Travel Shirts by West Peak Apparel, contact us by completing and submitting the form below. If you are looking for a specif part number, please include it with your message.